Analysis: A U.S. Senate With a Texan at the Top? While the junior U.S. senator from Texas hogs the limelight, the senior senator could soon move into management of that chamber. John Cornyn, who took office in 2002, is in the No. 2 spot in the Senate’s Republican leadership. His party has been in the minority since 2007. But with prognostications pointing to some Republican pickups in Tuesday’s elections, Cornyn could be in a leadership role in the political party that is actually in control of the Senate. The eyes of Texas are on Gov. Rick Perry, who might run again for president. They are on Ted Cruz, who has been in the Senate for less than two years and is better known than most of its members — even those who have been in office for a long, long time. And they are watching the first major turnover in state government in years, starting with the race to succeed Perry in the governor’s office he has occupied for almost 14 years. Cornyn, who has had a quieter role over the past two years, could be the next star. He hopes to be the majority whip — the same job he has now for the minority. An upset in Kentucky could even put him in contention for the top job of majority leader, if Mitch McConnell loses. What a turnaround: Cornyn, a year ago, was assailed by activists in his own party — the sort of establishment fellow GOP populists wanted to throw out. They tried to recruit opponents for his 2014 re-election bid and settled, having failed to bring in the sort of candidate Cruz turned out to be, for U.S. Rep. Steve Stockman, R-Friendswood. Cornyn made quick work of Stockman and six other challengers, winning the primary with 59.4 percent of the vote. And he seems well on his way to re-election over a Democratic opponent — David Alameel of Dallas — who put up a bigger fight two years ago in a congressional primary than he has in this year’s statewide race for the Senate. Cornyn made campaign stops last week with candidates like Greg Abbott, a former colleague on the Texas Supreme Court who is the party’s nominee for governor, and George P. Bush, who jumped into the family business with a run for state land commissioner. 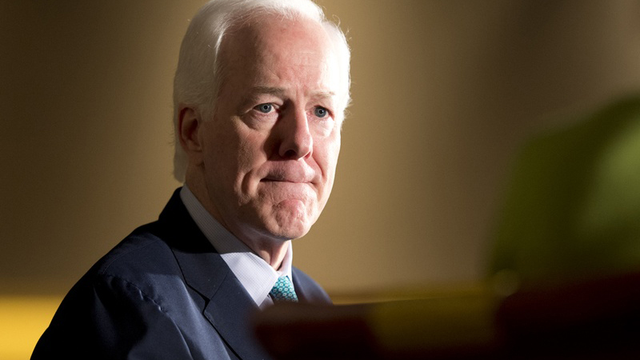 Like everyone else in Congress, Cornyn is watching the elections closely. He is optimistic that the Republicans will win and that the only person ahead of him in his party’s current Senate hierarchy will be among the winners. If the Democrats hold the majority in the Senate, Cornyn and other Republicans will be just where they were before the election. If enough Republicans win, they will get the majority back for the first time in six years. And if McConnell loses, Cornyn would be in contention to become the first Senate majority leader from Texas since Lyndon B. Johnson. But what if he loses? “All of the leadership positions will have to be voted on after the election, so that would create a scramble,” he said, barely entertaining the thought. A change in control of the Senate could revive some of the same intraparty debate that pestered Cornyn a year ago — contrasts personified by the state’s two senators. Cornyn said he and Cruz are moving in the same direction despite their differences. “Ted’s experience, running in a contested Republican primary in a runoff in a red state, I think, has informed a lot of the way he has approached the job,” Cornyn said. “But he’s a very smart, talented guy, and all of us who have come into the Senate have grown, hopefully, to learn how to be effective.